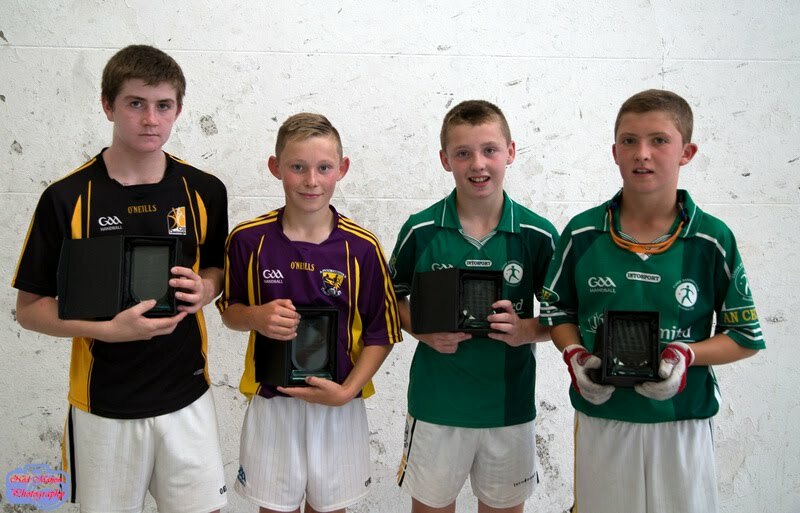 60x30 Doubles Nationals were held in Kilkenny and Tipperary venues on Saturday last. Talbots Inch hosted the Mens Open which saw Talbots Inch’s own Michael Walsh and Ciarán Neary take part. They defeated Michael Hedigan/Daniel Relihan Cork in the first game. In the quarter final they defeated Mayo’s Dessie Keegan and Joe McCann, in the semi final Michael and Ciarán were defeated by Dublins Eoin Kennedy and Carl Browne and the Dublin pair went on to be eventual winners. 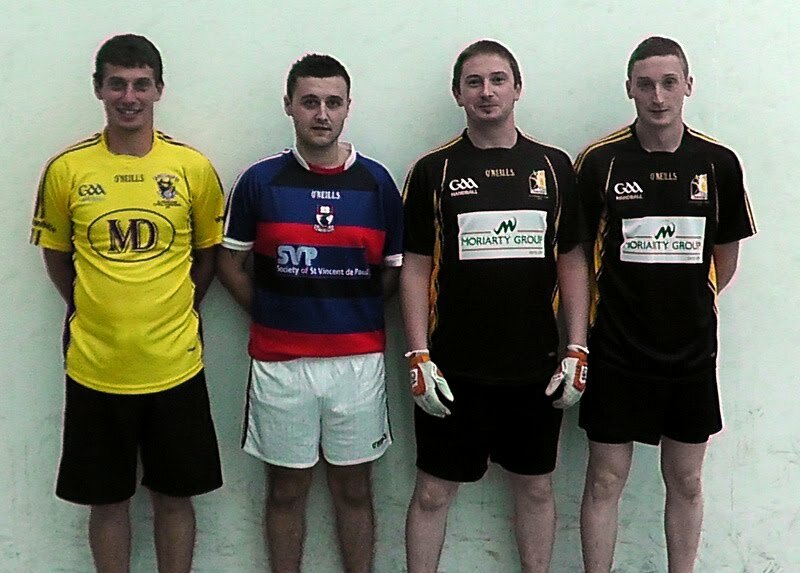 Mens B was held in Clonmel, Tipperary with Kilkenny been represented by the Burke brothers from Kells Brendan and Diarmuid and Kells Dan Breen who teamed up with Jason Murphy from Wexford. Mens B was played in two groups and also played in a round robin with Dan and Jason winning their first game by defeating the eventual winners Ryan and Daragh Daly from Tyrone, next they came up against Limericks Sean Murphy and Anthony Donnelly who defeated them. Four aces separated all pairs leaving Dan and Jason qualifying for the Plate final. The other group saw Brendan and Diarmuid Burke defeat Galen Riordan Wexford and Martin Mullins Carlow, they were defeated by Carlow’s Daniel Fenlon and Ollie Ryan, The Carlow pair also defeated the Riordan and Mullins which saw the Burke brothers qualify for the Plate Final against Dan Breen and Jason Murphy. This was a very close game with Dan Breen and Jason Murphy winning by the narrowest of margins. Masters Doubles was also held in Talbots Inch with Canice Quigley St Canices teaming up with Carlows John Ryan. The pair defeated David and Paul Maher Tipperary in semi final. They played and defeated Paddy Donovan Laois and Frank Daly Dublin in the final. Boys 13&Under was held in Clogh. Kilkenny was represented by Billy O Neill and Kyle Dunne Clogh and Jack Holden Kilfane who teamed up with Wexfords Glen Murphy. Billy and Kyle defeated Daniel Farrelly/Emily Sheridan-Fox Meath in their first game and in the semi final defeated Diarmuid Moore and Richard Lawlor Wexford. Jack and Glen got a bye to the semi final where they defeated Liam Egan and Fionn Cusack Roscommon. The Final saw Jack Holden and Glen Murphy defeat Billy O Neill and Kyle Dunne. 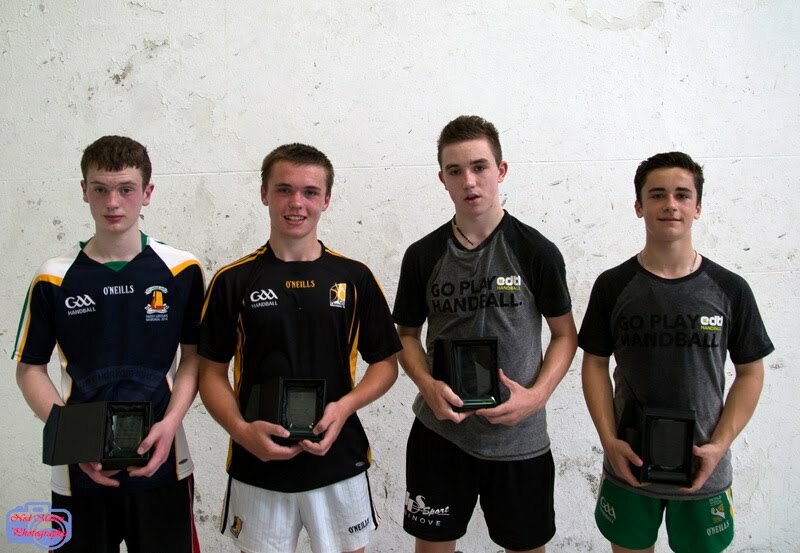 Boys 15&Under was also held in Clogh. Kilkenny were represented by Cloghs Aidan Barry & Ciarán Cooney, Eoin Regan & Cathal Barry & Shane Dunne who teamed up with Corks Tadhg O Neill. Aidan and Ciarán were narrowly defeated by Peter Donohue Galway and David Walsh Cork in their first game which saw them play in the plate group where the defeated Kevin Diggin Kildare and Conor Condon Kells to qualify for the plate final. Cathal and Eoin were defeated by Colin Ryan and Jason Tipperary in their first game and were defeated by Jerome Cahill and James Prentice Tipperary in the plate semi final. Aidan and Ciarán were defeated by Tipperary in the Plate Final. Shane and Tadhg defeated Jerome Cahill and James Prentice Tipperary and Colin Ryan and Jason English Tipperary to qualify for the final where they played Daniel Kavanagh Wexford and Sean Kerr Tyrone. This was a very close exciting game with great handball on show with Kavanagh and Kerr winning by 3 aces. Boys 17&under was held in Mullinavat. Dion Bourke Mothel and Roy Cullen Kells were defeated by Shane Flynn and Daniel Moynihan Cork and were defeated in the plate semi final by Mikey Egan and Cathal O Connor Roscommon. JJ English Goresbridge and Padraig Cooney Clogh defeated Darren Carter Westmeath and Patrick Murphy Mayo but were defeated in the semi final by Fergal Coughlan Clare and Niall Joyce Mayo. Girls 15&Under was held in Kilfane. Aoife Holden and Dearbhail O Keeffe Kilfane defeated Edel Mulholland O Loughlins and Sian Cooke Offaly, Aoife and Dearbhail were defeated in the semi final by Sinead Meagher/Ella Donnellan Tipperary. Roisin O Keeffe Kilfane and Noelle Dowling were defeated by Sinead Meagher/Ella Donnellan Tipperary. 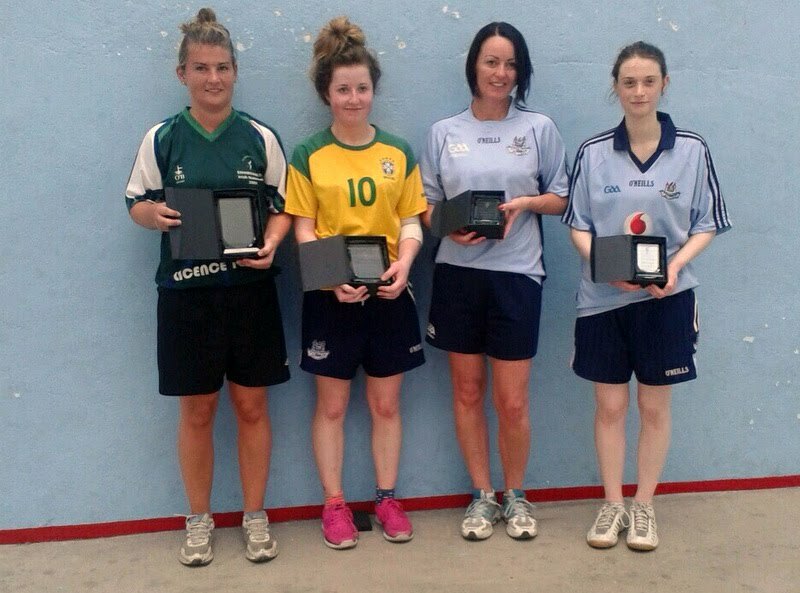 In the Plate semi final Roisin O Keeffe Kilfane and Noelle Dowling defeated defeated Edel Mulholland O Loughlins and Sian Cooke Offaly but were defeated in the plate final by Aoife Flood Clare and Sile Spain Tipperary. A big thank you to all clubs who hosted these games.